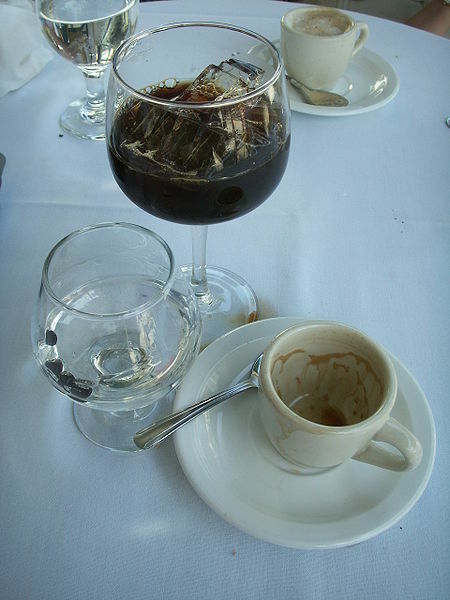 Left: Sambuca (an anis-based liquor) served with coffee and ice. Sambuca contains essential oils obtained from star anise, Illicium verum, which give the liquor a strong anise flavor. The oils are added to pure alcohol, a concentrated solution of sugar, and other flavoring. It is commonly bottled at 42% alcohol by volume (84 proof). Sambuca can be served neat, as Ammazzacaffè or just as refreshment. Sambuca can be served with ice, optionally adding some coffee beans as ornament. The ice enhances the flavors and changes the color of the drink from transparent to dense white. In Italy it is common to serve neat Sambuca with some floating coffee beans dropped on it: it is called Sambuca con la mosca (literally, "Sambuca with flies"). The beans are there as an ornament, but they can be chewed to increase the taste of anise. It is usually served in restaurants with 3 coffee beans and is said that the beans represent health, happiness, and prosperity. Sambuca can be added to coffee as a sweetener instead of sugar. The mixed drink in Italian is called Caffè corretto (literally, "corrected coffee"), though more commonly caffè corretto refers to grappa and coffee. Sambuca can be served adding fresh water, becoming a refreshing less alcoholic drink. Although uncommon, Sambuca can be served with cola to make a refreshing long drink. Much like with Ouzo, mixing Sambuca with cola creates a cloudy brown drink due to the Ouzo effect. 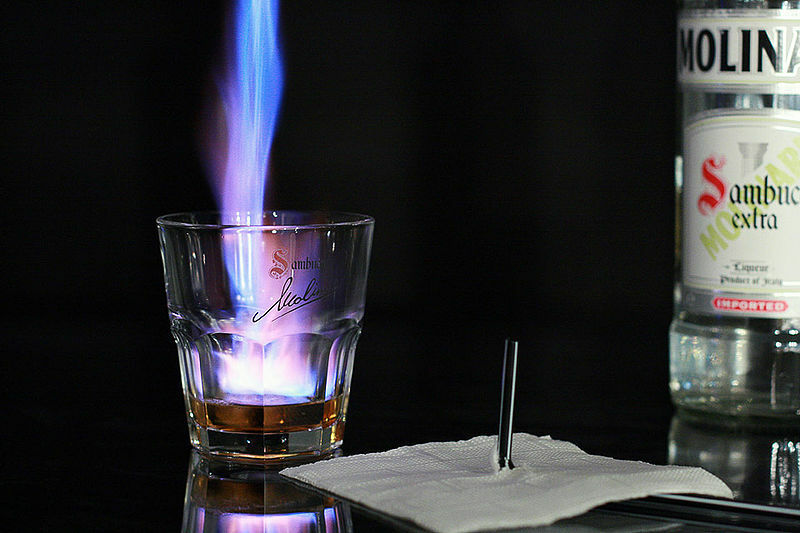 Sambuca may be served in a shot glass and then set on fire for a second or two, in order to increase its flavour. Another alternative is to catch the fumes in a snifter, and then drink the heated shot, after which the fumes are sucked up from the snifter through a straw.